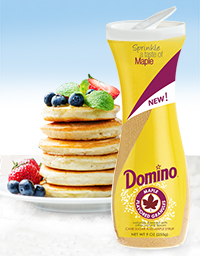 Domino® Maple Flavored Granules – Sprinkle a Taste of Maple! Add a taste of maple flavor without the stickiness of maple syrup. Delicious Domino® Maple Flavored Granules are a blend of cane sugar and a taste of maple that can be sprinkled or easily poured. Make French toast in a pinch, add to oatmeal or sprinkle over pancakes for added crunch. Maple Flavored Granules are also great to use in baking and cooking, in foods like ham or pork chops. Learn More. 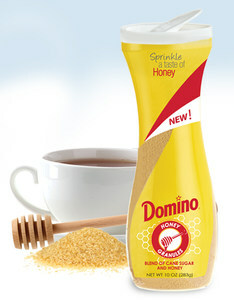 Domino® Honey Granules – Sprinkle a Taste of Honey! Try delicious Domino® Honey Granules. These are free-flowing crystals made of cane sugar and honey so you can easily add a sweet honey flavor to foods and beverages. Made without artificial colors or flavors, Domino® Honey Granules sprinkle easily or measure out for recipes. Add a taste of honey, neatly, and without the stickiness! Learn how to use Honey Granules for cooking and baking. 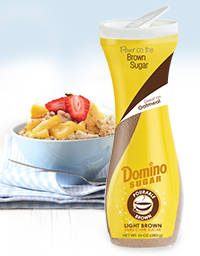 Domino® Pourable Light Brown Sugar – The Topping Sugar! Your favorite brown sugar now sprinkles and flows right out so you can add a sweet crunch to favorite breakfast foods, fruits or baked goods. 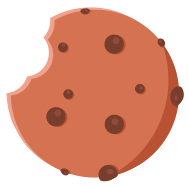 This free-flowing crystal version of the classic Light Brown Sugar does not clump, cake or harden. And the pourable brown sugar is also handy for baking. Learn more. 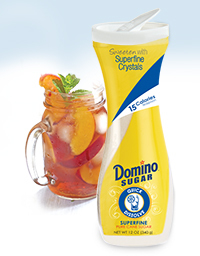 Domino® Quick Dissolve Superfine Sugar – The Beverage Sugar! Sweeten hot and cold beverages smoothly and rapidly with the fine sugar crystals of Quick Dissolve Superfine Sugar. It’s the perfect everyday sugar — try it in iced tea, iced coffee, smoothies or cocktails. Learn more.